Face of Avon: FALL TREND ALERT! ITS THE LATEST LOOK! FALL TREND ALERT! ITS THE LATEST LOOK! Everyone knows Avon keeps you up to date on the latest trends while keeping them affordable. What was the buzz at fashion week? Matte nails. What are matte nails? Its a shine free nail. Kinda dull. There is a Matte top coat you can buy if you want your nails to shine but that will just take away from the look we are trying to get. 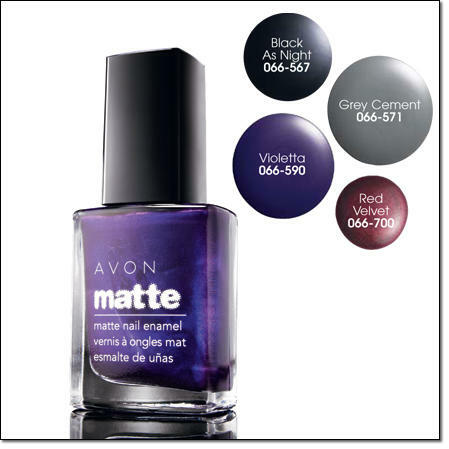 Avon has just launched their new MATTE nail polish line which only has a small variety of colors to choose from but they are all gorgeous! To order yours clink on the link below. Whats the buzz at fashion week? Click here to order yours today with free shipping.